Bill “Tiger” Beatty played football at UND from 1947-49. Bill had not played the sport at Lakota High School, but line coach Don Clark saw him in a UND phy ed class and asked him to try out for the team. Bill started for three years at guard for the Fighting Sioux, and was given the nickname “Tiger” because he was so strong and tough in the trenches. Bill Beatty was born August 15, 1928, the son of Cecil and Jessie (Langton) Beatty, on a dairy farm west of Lakota. He enjoyed school and the University of North Dakota. Bill raced snowmobiles for Arctic Cat Corp. in North Dakota, Michigan, Minnesota, and Wisconsin. He competed in the Winnipeg to St. Paul 500 mile Ironman Race, and won more than 100 trophies over his career. Bill later farmed with his father and also custom harvested in Oklahoma, Kansas, Nebraska, South Dakota, and the Lakota area. Bill married Patricia Ann (Lee) Sundeen on January 29, 1980. Bill & Patty traveled throughout the U.S., Canada, South Africa, Kenya, London, England, and the United Arab Emirates. 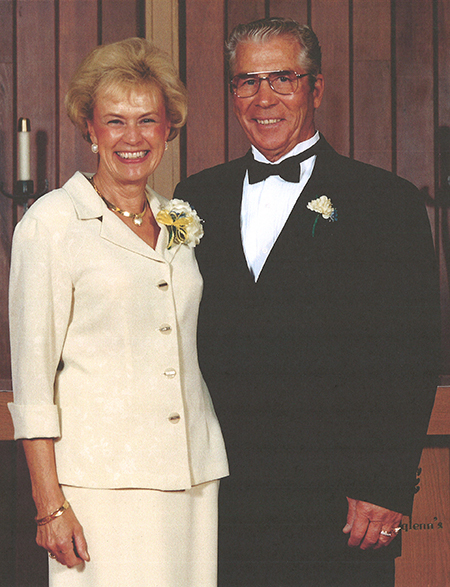 The couple rarely missed a UND football game at Memorial Stadium and, later, the Alerus Center. If he wasn't at the game, it was most likely because he was hunting ducks, geese, upland game or deer with his stepsons. Beatty died at age 84 on July 10, 2013, at the Good Samaritan Society in Lakota, N.D. Following Bill's death, his stepson, Ross Sundeen, '93, and his wife, Tricia, established the Bill “Tiger” and Patricia Beatty Family Football Endowment. The endowment provides one or more scholarships to members of the UND Football team who are in good academic standing and demonstrate team leadership qualities. Preference is given to North Dakota residents. “My step father loved UND Football and his days at the University. He would be very proud that you, a small town North Dakota boy, are the 2015 recipient of the Tiger Beatty football scholarship. I know my mom is. Click here to support the Bill “Tiger” and Patricia Beatty Family Football Endowment. If you pay taxes in North Dakota, you may be eligible to take advantage of an additional tax credit on your gift. With a minimum $5,000 gift to the Bill “Tiger” and Patricia Beatty Family Football Endowment, you may benefit from both a federal tax deduction AND a North Dakota income tax credit equal to 40% of the charitable gift, thereby significantly reducing the net cost of giving. Ask your tax advisor for more information.